We had an interesting day yesterday. We got up and ran to wal-mart to get the 2 ingredients I was missing for snickerdoodles. When we got there, the car was wobbling really bad. We got out of the car and found this. Apparently it happened on the freeway the night before. Thankfully we made it safely home. Eric put the donut on and we drove home. Thankfully we have some extra tires in the garage that are the same size. I have to buy new tires before inspection this year, but payday isn’t for a few more days. The plan for today was to go to the Daughters of the Utah Pioneers Museum on main street and then get ice cream cones. When we got home, we walked down to main street instead of driving. Emma loved the museum. The lady there taught her a lot of things. After the Museum we went over to the visitors information place and got a lot of brochures about Cache Valley. I want to do a lot of fun free stuff this year when I have a Saturday off. Next we went down to the old fashioned candy shop that just opened on main street. We bought Aggie ice cream for all of us. I had the sherbet since I am sensitive to whey and they use a lot in their ice cream. 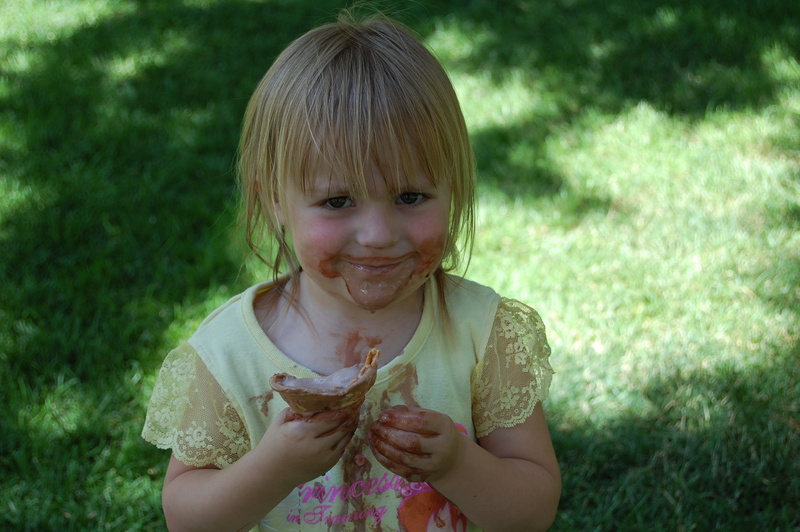 Sammie thoroughly enjoyed hers. It was about 3:30 by the time we got home so I didn’t have time to make the snickerdoodles. We watched an episode of stargate. 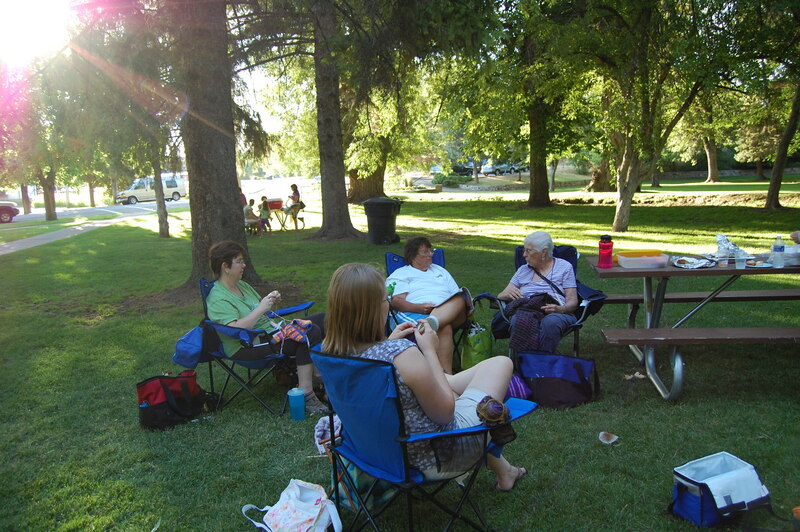 Then we made sandwiches and headed down to the park for knit night. This morning we got our family pictures taken. The lighting wasn’t very good so our friend John is going to photoshop them. When he is done, I will post them. Today, we went to the zoo with some of Eric’s family. The kids had a blast and the 2 babies were good. After the Zoo, we had dinner at Eric’s parents place and let the girls play on their new playset. We started the day by getting the lawn mowed and then we went down to spinners at Garff Gardens. After Spinners, we ran around town and got some errands done. Next we stopped by one of the spinner’s houses and Eric got her e-mail running for her. I love being able to loan his expertise out to friends. Next stop was home for lunch. Then we let the girls have a water fight. We all got involved. Rachelle didn’t let me play much, but I was able to get Sam and Emma a few times. After the fight we gave the girls a quick bath and had yummy fresh corn on the cob for dinner! Sam and Emma are currently playing and Rachelle is sacked out on or bed. Rachelle doesn’t like to sleep anywhere, but home. To save our sanity, we are having a staycation. This morning, we took the girls hiking on the trails around the Denzil Stewart Nature Park. We hiked for about about an hour. Eric made Sammie walk the entire time. I don’t usually participate in these, but I liked this one. 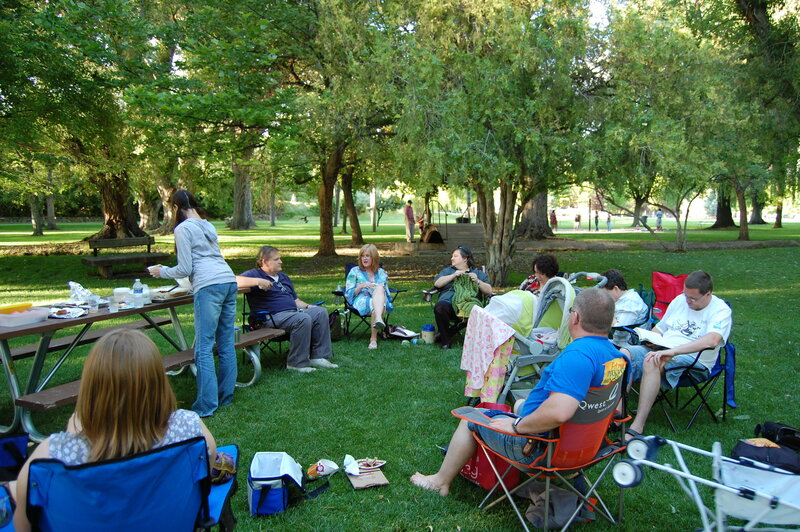 If you are ever in Logan, you have to check out this park. It is so much fun! It is at the Whittier Community Center. We had a blast. I am contemplating having our family pictures done there this year. We blessed little Rachelle on Sunday afternoon. Everyone on my side except my brother made it and everyone except 2 families on Eric’s side made it. In fact, there were more people from my side that made it than Eric’s side. I wanted to get pictures of every one that came, but by the time I got around to it, most of my family had left. Kelley, Jo and Jodie came as well. In the circle we had, Dirk, Eric (of course), my dad, Eric’s dad, Seth, Greg (Trudy’s fiancée), Jim (Kathy’s boyfriend) and Bishop Reynolds. That night, Rachelle decided to voice her protest about this long weekend. She screamed, cried and fussed for 8 hours. Needless to say, it is a good thing that we decided to just hang around in Logan for our vacation. It is just not worth her frustration. Next year will be a lot more fun for her anyways. Monday was our 8th Anniversary. With all the excitement of the weekend, we didn’t do anything exciting. We took Kami shopping for work shirts than ate lunch at Jack’s Wood Fire Pizza (best pizza in town). After that we came home and just relaxed. Later in the afternoon, we let the girls play outside in the pool. It was nice to just relax and not worry about anything. I love you Eric. We have had 8 great years and I am looking forward to many more!